Did you know making wine from grapes is one of the most ancient arts and the beverage of choice in the Bible? According to Genesis, one of the first things Noah did after the Flood was plant a vineyard to he could make wine. Researchers have now rediscovered what the physicians of the Bible knew centuries ago. In moderation, wine has a profound impact on our health and healing. Just a single glass of wine a day may be enough to raise the good cholesterol by 7% and help the body put up a barrier to a variety of cancers. One hundred years ago, doctors in France noticed that during one cholera outbreak, people who drank wine straight seemed less likely to be stricken than neighbors who added water to their wine. As a test, cholera and typhoid germs were added to containers of water, pure red or white wine and a half-and-half mixture of water and wine. Amazingly, while the germs in the plain water were unaffected, those cholera germs in both the wine and the diluted mixture were wiped out within 15 minutes. The typhoid germs in the wine lasted 24 hours before dying off. Since then, similar tests have achieved the same results. But to everyone’s surprise, it turns out that the fermentation process releases polyphenols – chemical compounds that attack bacteria in much the same way that penicillin does. Researchers say that red win diluted in a 1-4 ratio with water has the same potency after 15 minutes as 5 units of penicillin per milliliter. Wine also appears to help stop heart disease and cancer. A study at the University of Ottawa in Canada concluded there is a clear link between wine consumption and lower rates of heart disease. Countries where more than 90% of alcohol is consumed in the form of wine have the lowest rate of heart disease deaths. Red wine also seems to strengthen the body’s defenses against cancer, just as it does against heart disease. White wine may carry some of the same therapeutic benefits, but research so far seems to indicate that red wine is the most effective cancer-blocker. 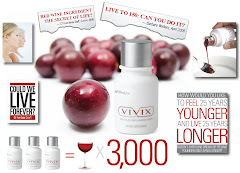 No wonder we are getting such great results from our Resveratrol Anti-Aging Product called Vivix! !